I think I saw playful behavior between species documented in the wild as well - as long as they weren't hunter and prey or direct rivals for the same food. The key observation to make here is that the bears in the video are in excellent condition. Grizzly bears in coastal Alaska and British Columbia can also be extremely tolerant of other bears and human observers when they are well-fed on abundant salmon. Aggressive predatory behavior increases drastically with hunger and reduced resources. I think Magma is saying that the bears are often nice so long as they're not hungry, so it's hard to say from (just) this video that they're in trouble. since the picture is more than 8 years old, still not sure what it means... and it might be older than that. I remember reading the original article back then, it was about the psychology of how animals recognize a "play attitude"
Another picture from 8 years ago? I recognise that the article is dated the 24th, but I don't recall seeing that much bare rock in NW Greenland this year. It's no biggy, but I check Flade Isblink on a daily basis & that picture, with the expanse of bare rock while Independence Fjord is frozen was unusual, to say the least. As the northern hemisphere experiences the heat of summer, ice moves and melts in the Arctic waters and the far northern lands surrounding it. 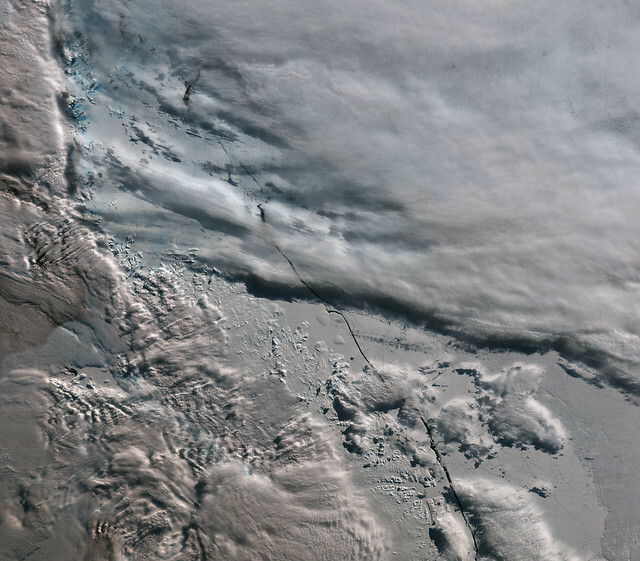 The Moderate Resolution Imaging Spectroradiometer (MODIS) aboard NASA’s Aqua satellite captured this true-color image of sea ice off Greenland on July 16, 2015. Large chunks of melting sea ice can be seen in the sea ice off the coast, and to the south spirals of ice have been shaped by the winds and currents that move across the Greenland Sea. Along the Greenland coast, cold, fresh melt water from the glaciers flows out to the sea, as do newly calved icebergs. Frigid air from interior Greenland pushes the ice away from the shoreline, and the mixing of cold water and air allows some sea ice to be sustained even at the height of summer. According to observations from satellites, 2015 is on track to be another low year for arctic summer sea ice cover. The past ten years have included nine of the lowest ice extents on record. The annual minimum typically occurs in late August or early September. The amount of Arctic sea ice cover has been dropping as global temperatures rise. The Arctic is two to three times more sensitive to temperature changes as the Earth as a whole. I double-checked using Aqua on Worldview, and it seems to check out (att). Volcanic lakes near Mýrsalsjökull Glacier, Iceland. One strange thing about this season is the remaining sea ice in Cumberland Sound / Baffin Island, relatively south at +66? oh my god that poor bear!!! To be fair, you can't tell about climate from a single bear. There have always been sick and old polar bears. Just a coincidence. Sorry for for the inappropriate relation. Red Fox with corpse of an Arctic Fox. This is the winner of the 2015 Wildlife Photographer of the Year competition. My personal favourite is the three Red-footed Falcons. This still is from the May 2014 high resolution video of a calving event at Jakobshavn. The whole 11 minute youTube is very much watching -- be sure to use full screen mode. See the photos at the end of the Arcticle. A Lynx and a Wolverine in the same image. Northern Norway. Well, that is what you get setting out meat in winter bait traps. Here is what you get just providing habitat. Apparently "The Sentinel 3 Synthetic Aperture Radar Altimeter is better than the CryoSat altimeter"
Sharp boundary between fast ice and not-so-fast ice in the Laptev Sea in this MODIS-Aqua image. Care of Climate Reanalyzer - This I think is a remarkable image. It's Arctic temperature anomalies predicted about 42 hours out. Most of Atlantic side of the arctic, from 90E to 90W, all the way from the pole to Iceland is red. Sentinel 3 image. Click through for a description. Dayum. 2-4KM wide? Probably close to 500M deep. That's the best part of a 1000KM long, I'll wager. An arch in Bering Strait on March 14. Beaufort captured on Worldview, using brightness temperature band 31-night, with the palette compressed to -50 to 0C. Darker is colder. Note the streams of higher temperature being swept clockwise to the west carried along by the flow around the high pressure currently over the arctic. Meltwater pools in a low area of the Greenland ice sheet, southeast of Ilulissat. August 2014.